A super heavy platinum court wedding band, but a delicate 2mm in width. Perfectly symbolises your commitment while exuding everyday elegance. Platinum 2mm super heavyweight court ring is rated 5.0 out of 5 by 1. Rated 5 out of 5 by Anonymous from Simple & Stylish Beautifully made & very comfortable to wear. 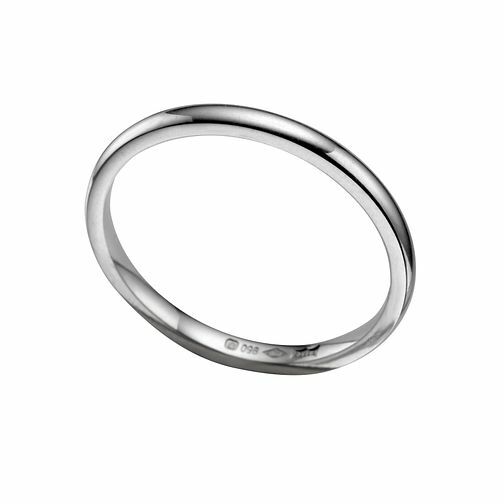 Can be worn on its own or with an additional one or two rings, without making your finger uncomfortabe. Has a nice weight to it, so it feels substantial, a lovely wedding band.